Glens tend to have good appetites and efficient metabolisms. Their food should not be too rich or abundant. Please give them sufficient exercise to prevent getting fat. This will extend their lives and help prevent health problems. Adult Glens would appreciate a brisk 20-30 minute daily walk, and are capable of more. Although Glens don’t particularly care for hot weather, some have made adjustments to tropical areas. Grooming is simply a matter of an occasional bathing and brushing as frequently as your tastes desire. A slicker works well for brushing. If the coat gets long enough that it mats often, it is probably time to strip the dog. This is a simple procedure requiring an hour or so for an adult Glen. It involves pulling out the long hairs of the outer coat, and it does not hurt the dog if you wait until the coat is ready to be stripped. If the hairs don’t come out easily, the dog is not yet ready to be stripped. I have always been frustrated by generic “breed” books that tell you how to raise your [insert name Glen here] puppy. Some of the advice I have read in them is outright wrong for a Glen. 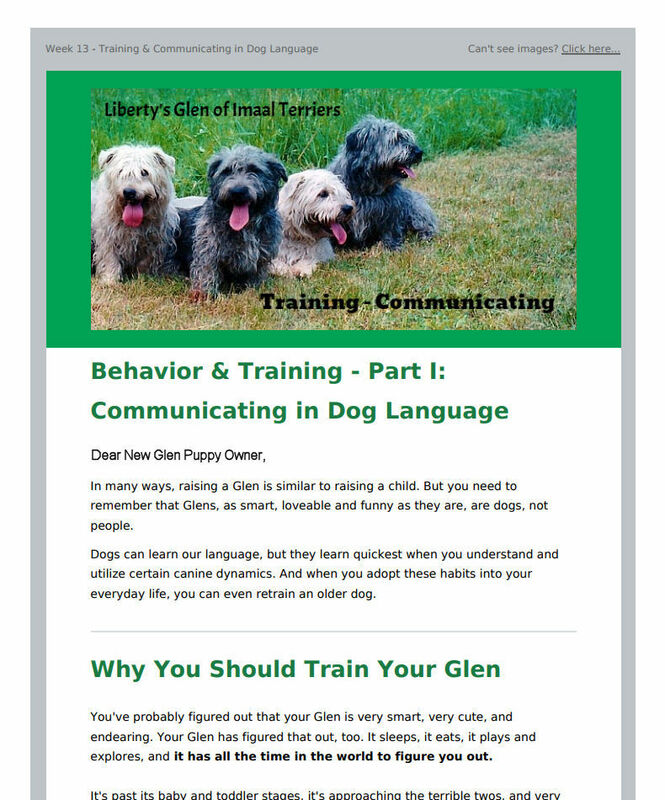 Over the years, based on my own experience as well as feedback from my puppy owners, I have developed a series of detailed emails that guide you through your Glen of Imaal Terrier’s puppyhood. These fifteen-plus emails are scheduled to arrive at the appropriate stage of development for a Glen puppy and cover topics such as Feeding, Housebreaking, Veterinary Care, Socializing, Training, Grooming, and some topics specific to this breed such as Puppy Limp. “Your e-mail has helped me immensely! !” Virginia T.
“Thank you for sending these important instructions, As a new owner of a Glen, I find them most helpful.” Walter P.
“Dear Ara, this is excellent reading… and guidance. 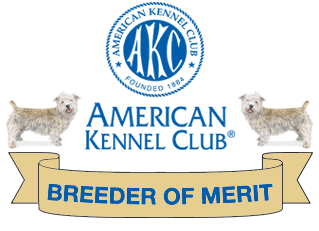 Matt read before I did and he keeps quoting it.” Adriene D.
My puppy owners automatically receive this Glen of Imaal Terrier Care and Training Series. If you do not get your puppy from me, but still would like to receive this information tailored to Glens, you may purchase it. Fill out the form, being sure to include the birthdate of your puppy (so we get the timing of the topics right).